in the heart of Manchester, couldn't get better position. 2 mins from printworks and 4 from arena. could do with abit of titavating, grubby grouting and water swollen door in bathroom and stains on bedroom floors. Nothing. Poor staff. Took deposit and refused to refund until I contacted my bank and got it back through them. All night the apartment had people running and knocking on our door. Not a pleasant experience. My advice is pay extra and avoid this crap hole. 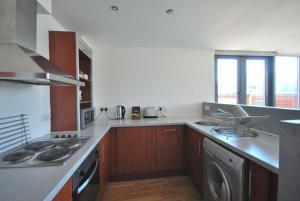 Location excellent, modern apartment, perfect for short stay. Great location. We were upgraded to a larger apartment free of charge which was great. Good price & quiet. More spacious than a hotel room. Good facilities for self catering. Wasnt impressed, only upside was that the apartment was very spacious. Location is good for couples groups on the lash, area is scruffy but 2 min walk down bottom end and it’s nice and clean. Atana Apartments This rating is a reflection of how the property compares to the industry standard when it comes to price, facilities and services available. It's based on a self-evaluation by the property. Use this rating to help choose your stay! One of our best sellers in Manchester! 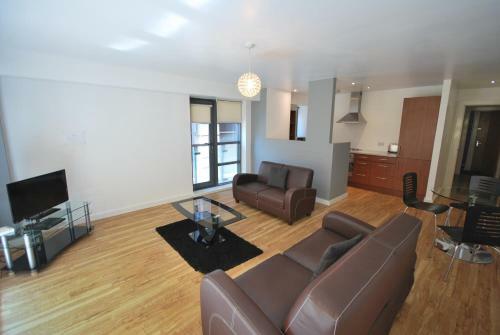 Located in the heart of Manchester City Center, Atana Apartments is a 5-minute stroll from the Manchester Arena. Each of the 34 serviced apartments are spacious, and feature a well equipped kitchen and an open-plan living space. Free WiFi is provided throughout the accommodations. Some apartments feature balconies. Based at the entrance to Manchester’s Northern Quarter, there are many boutique vintage shops, tea rooms, bars and restaurants in the area. With the Arndale Shopping Center located across the road from Atana Apartments, Victoria train station a 3-minute walk away and Piccadilly station a 10-minute walk away. Manchester City Center is a great choice for travelers interested in nightlife, live music and bars. 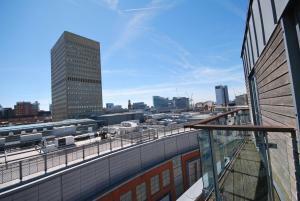 뀐 Located in the real heart of Manchester, this property has an excellent location score of 8.5! When would you like to stay at Atana Apartments? These compact apartments provide up to 450 sq.ft of living space incorporating a dining area with an open-plan kitchen with a choice of Twinings teas. The lounge has a multi-channel LCD TV and DVD player, and high-speed Wi-Fi. These spacious apartments provide up to 500 sq.ft of living space incorporating a dining area with an open-plan kitchen with a choice of Twinings teas. The lounge has a multi-channel LCD TV and DVD player, and high-speed Wi-Fi. With step-out balconies, these spacious apartments provide up to 500 sq.ft of living space incorporating a dining area with an open-plan kitchen with a choice of Twinings teas. The lounge has a multi-channel LCD TV and DVD player, and high-speed Wi-Fi. These spacious apartments can accommodate 3 guests and provide up to 550 sq.ft of living space, incorporating a dining area with an open-plan kitchen with a choice of Twinings teas. The lounge has an additional single bed, multi-channel LCD TV and DVD player, and high-speed Wi-Fi. With step-out balconies, these spacious apartments can accommodate 3 guests and provide up to 550 sq.ft of living space, incorporating a dining area with an open-plan kitchen with a choice of Twinings teas. The lounge has an additional single bed, multi-channel LCD TV and DVD player, and high-speed Wi-Fi. These spacious 2-bedroom apartments provide up to 700 sq.ft of well-designed living space, incorporating a dining area with an open-plan kitchen with a choice of Twinings teas. The lounge has a multi-channel LCD TV and DVD player, and high-speed Wi-Fi. With step-out balconies, these spacious 2-bedroom apartments can accommodate 5 guests and provide up to 700 sq.ft of well-designed living space, incorporating a dining area with an open-plan kitchen with a choice of Twinings teas. The lounge has a multi-channel LCD TV and DVD player, and high-speed Wi-Fi. With step-out balconies, these spacious 2-bedroom apartments can accommodate 6 guests and provide up to 700 sq.ft of well-designed living space, incorporating a dining area with an open-plan kitchen with a choice of Twinings teas. The lounge has a multi-channel LCD TV and DVD player, and high-speed Wi-Fi. 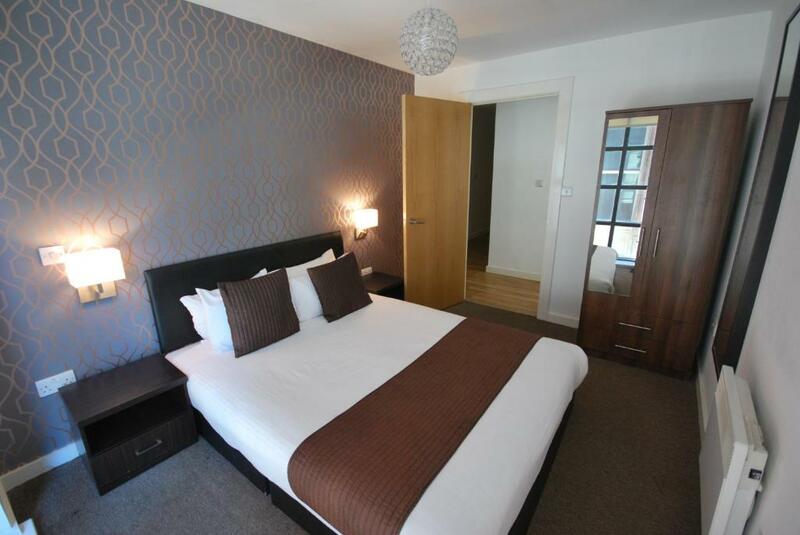 The first bedroom offers a double bed, there are 3 single beds in the second bedroom and a sofa bed in the lounge. This 2-bedroom Terrace Apartment features black and silver decor and is located on the top floor of the building, offering spacious living space with panoramic views of Manchester from the large balcony. With two separate bedrooms, each boasting an LCD TV with DVD player this apartment can accommodate up to 6 guests. Each bedroom is set with Egyptian linen and bath sheets and the bathroom offers complementary toiletries. High-speed WiFi and a Nespresso coffee machine are provided. 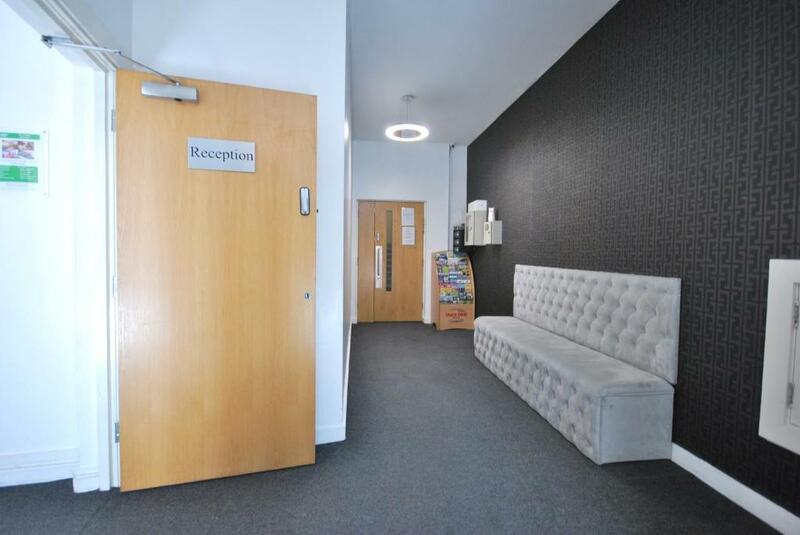 These city center serviced apartments are located 15 minutes from Manchester Piccadilly Station and a stone throw away from the MEN Arena. With a kitchen to make your own, you no longer rush to the breakfast room. 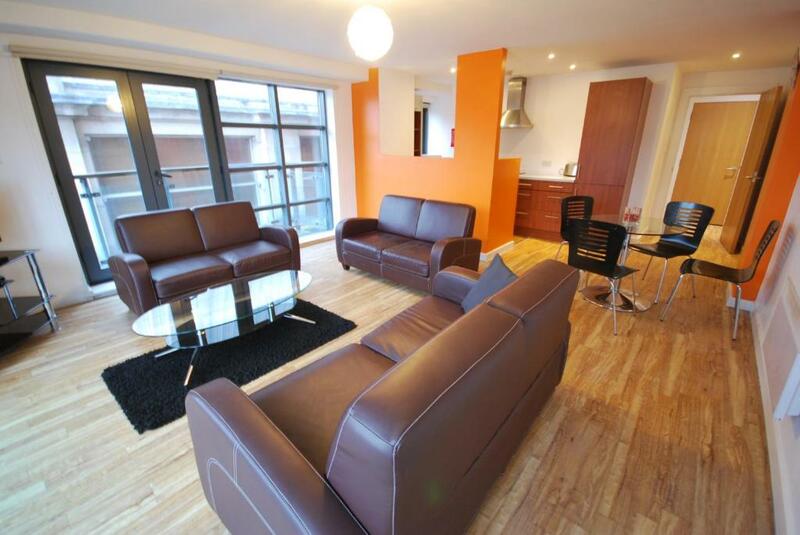 Our serviced apartments provides you with the best of both worlds. The service and feel of a hotel and the flexibility and independence of your own home. Area Info – This neighborhood is a great choice for travelers interested in nightlife, live music and bars – Check location Great location - show map Guests loved walking around the neighborhood! House Rules Atana Apartments takes special requests – add in the next step! A GBP150 damage deposit is required on arrival (around USD194.66). This deposit will be fully refunded 7 days after check-out, as long as there isn't any damage to the property. Atana Apartments accepts these cards and reserves the right to temporarily hold an amount prior to arrival. You must present valid photo ID and the card used for booking upon check-in. Entry will not be permitted if the card is not present. Please note that a security deposit of GBP 150 is required upon check-in for all bookings. The security deposit for the Terrace Apartment is GBP 300. The deposit must be from the original card used to guarantee the booking, and the cardholder must be present. Early check-in and late check-out are available subject to availability and subject to a surcharge. Please contact the property for more details. Please note that the card used to make the booking has to be present upon check-in. A damage deposit of GBP 150 is required on arrival. That's about 194.66USD. This will be collected by credit card. You should be reimbursed within 7 days of check-out. Your deposit will be refunded in full by credit card, subject to an inspection of the property. Poor location, very hard to find even with a sat nav. Rude staff, didnt get told about a deposit to be payed and didnt get the 10% off we were told we were entilted too. Room was dirty, toe nail clippings all over the floor. find out exactly which car park to park in as the postcode we got given by the staff took us to the wrong one. very dissapointed. Noise from outside but as a family you like it quite for kids but for me and my partner it would’ve been ideal. The only good thing about this property was it’s location. Finding the place was really difficult. Its a small doorway next door to a 24 hour burger bar. I had to telephone for directions. The staff member couldn't understand what I was asking which made directions challenging. He then tried to charge me a deposit of £100 (refundable after 5 working days). I couldn't see any reference for this on the booking and challenged him. He couldn't understand what I was saying, and eventually gave up trying to charge me. The carpark was impossible to find. However there is a cheap carpark just of Danzic Street which is £7 per day. Finally the area is worse than awful from around 7pm. My apartment overlooked a bar where there were 3 fights and constant police activity. The area is apparently known for this. The apartment itself was amazing. Far exceeded expectations. Spacious studio with sleeping capacity for four people. Bathroom was a good size, kitchen too. Great light / large windows, and airy too. Whilst the room was clean there was what seemed like a smell of smoke from whoever had previously been in the room. Room could also do with a fresh layer of paint. One thing to note is that the deposit they take when you arrive is £100 even if you’re a couple not a group and this then took over a week to come out of the pending section of my bank. Lastly, the apartment came up on booking.com after I filtered for places with parking, the advert says there is parking available nearby so doesn’t specify they provide it but it’s worth taking into consideration that the parking next to the apartment is a £20 charge per day. Location is great, restaurants on your doorstep as well as the Arndale Centre. Apartment is spacious. The place is tired !!!!!! Very nice apartment very clean. We really enjoyed our stay. Just a stones throw away from the Arndale shopping centre. 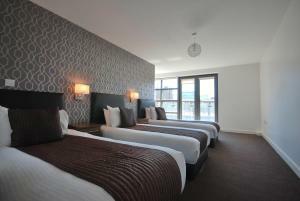 Great location, clean room, friendly staff." Not enough hot water for 3 people and the sound of the refrigerator was too loud. Good location and the elevator is working! The location was perfect and right in the middle of the City.